HOG1x dimensions: Each cover is 5" wide x 6 5/8" high x 1" thick (12.7cm wide x 16.8cm high x 2.5cm thick). This HOG1x with 4 LEDs is a more powerful version of the HOG1 which has 2 LEDs. More powerful light is needed when the nutrients are high in the water (such as nitrate = 40+, or phosphate = 0.2+ ). Note: The higher power LEDs will need to be covered by a cloth when new, because the strong light will over-power new growth in the unit and keep it from growing. Once growth starts, the cloth can be removed. Not only is the lighting twice as powerful, but the LED driver is a larger, solid black unit (a little different from the pictures shown here), similar to laptop computer power adapters. Other than the larger, black driver and LEDs in the HOG1x, the unit is identical to the HOG1. The main advantage of twice the LEDs is a stronger ability to filter during periods of high nutrients as stated above, but also to out-compete rocks that have become over-grown with algae. If you don't have algae problems, or high nutrients in your water, you may not need a HOG1x. 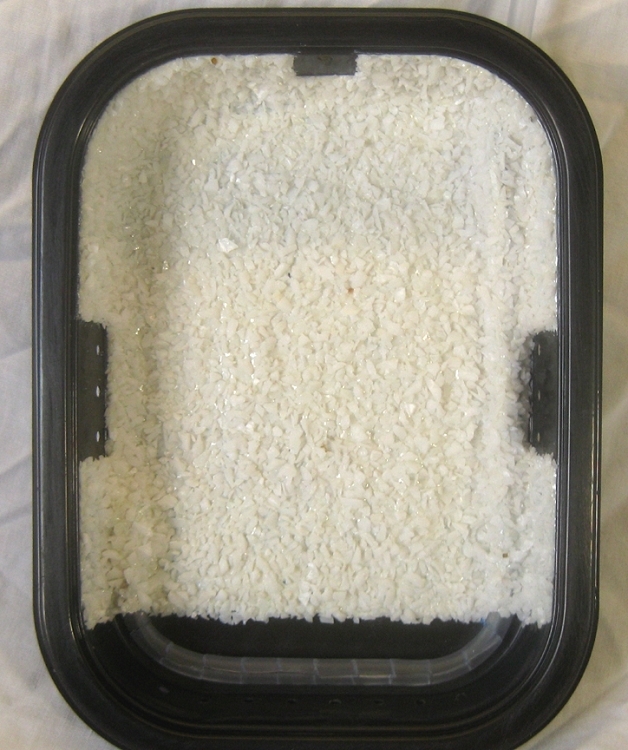 Although the space inside the HOG1x is the same as the HOG1 (and thus is still rated for 1 cube of food per day), the additional lighting will cause green growth to occur inside the unit when high filtering power is needed, whereas the less-illuminated HOG1 would still be growing dark brown or black algae instead. 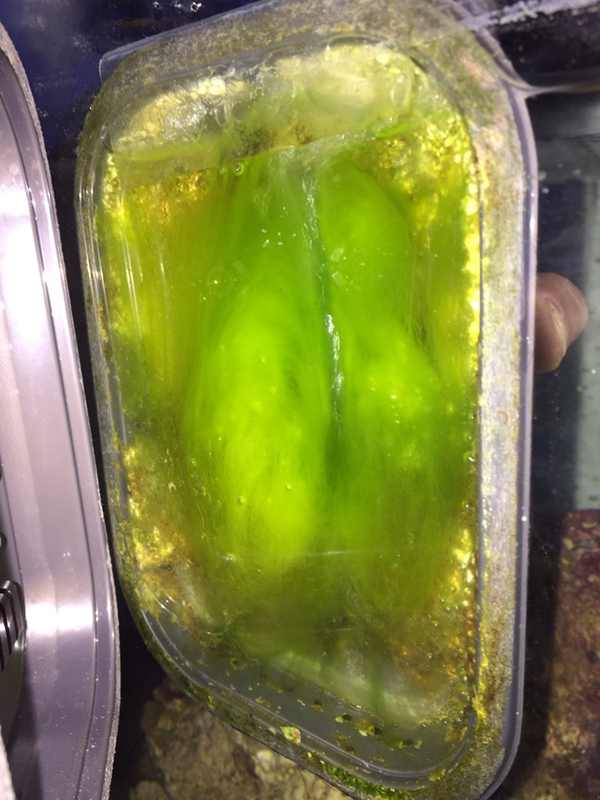 And of course, the more you can grow green algae inside the unit, the quicker you will remove nutrients and nuisance algae from your aquarium, and/or the quicker you can supply fresh green seaweed to your livestock. Another time when the higher power of the HOG1x helps is when your display is loaded with nuisance algae and your nutrients measure zero. 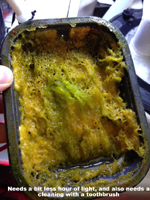 In this case you have a "scrubber" in your display which is consuming all the nutrients, and you need stronger photosynthesis in your HOG scrubber in order to "pull" nutrients from the nuisance algae in the display. Once the HOG1x is growing and you've removed the cloth from the LEDs, the photosynthesis will be at its highest power. The number of gallons or liters of water in your tank or sump does not matter. If you feed more than the above amounts, you can get multiple HOG1x units; multiple units are preferred over one larger unit because you can clean one unit per week, and because you'll always have one unit filtering while the other one starts growing again after a cleaning. Multiple units are also good for backup. 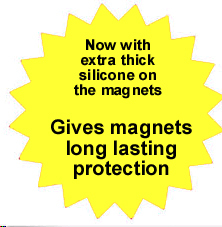 The magnets attach the outside cover to the inside cover, through the aquarium wall, and can be used on glass or acrylic 1/4 inch (6.25 mm) to 1/2 inch (12.5 mm). Not more. If your aquarium wall is 5/8" (15mm), it might work but you won't know until you try. If your aquarium wall is 3/4" (19mm) or bigger, then put the HOG1x on your sump wall instead; it will work the same. The Green-Grabber (tm) algal growth surface is so rough and prickly that is might be the roughest thing you've ever felt. A cactus might be sharper, but that's about it. Rough surfaces are critical for allowing algae to attach and grow and thus provide strong absorption of nutrients. 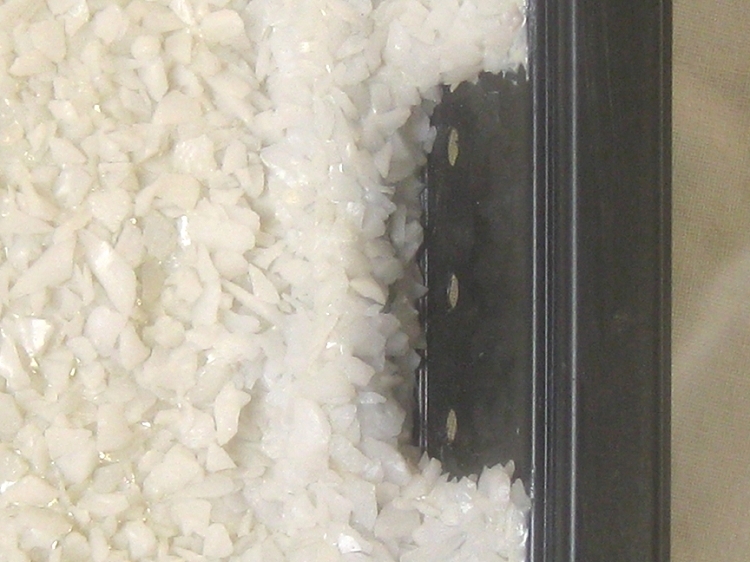 The rock-hard protrusions stick straight out 1 to 3 mm. 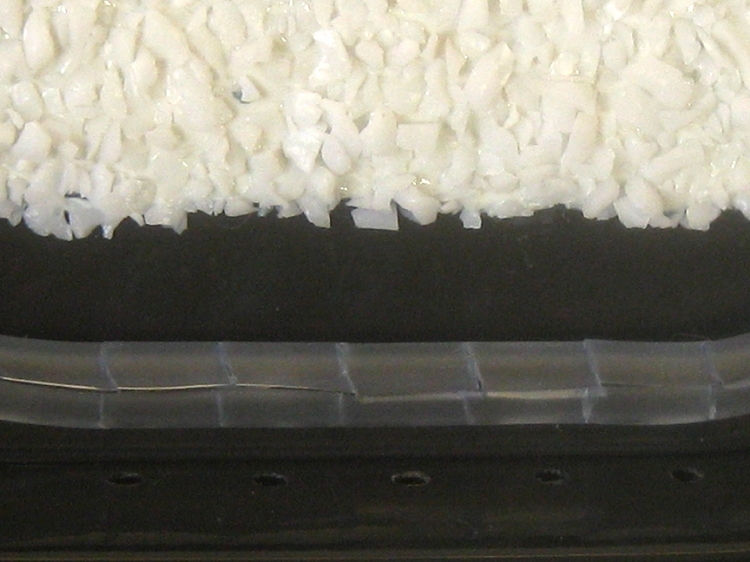 Conventional algae scrubber screens are made from "slippery" plastic canvas that is used for sewing and knitting; algae takes a long time to attach to it. Green-Grabber (tm) growth surfaces are not plastic at all; instead they are rock hard and have jagged rough edges and points (don't let children play with them). Green-Grabber surfaces are so good at grabbing algae and letting it grow that you may starting seeing tiny growth spots within hours, instead of days. And the white color of the Green-Grabber surface reflects as much light as possible, getting almost the effectiveness of a 2-sided screen even though it really only has a light on one side of the surface. This is a hand-built Hang-On-Glass® (HOG) Upflow Algae Scrubber® (UAS) with a Green-Grabber (tm) growth surface, magnet version, for glass or acrylic 1/4" (6.25mm) to 1/2" (12.5mm) thick. This is the typical thickness range for small and medium aquariums, and all sumps, however you should measure yours to be sure. No electrical parts go inside the aquarium; only air. And the air bubbler is already supplied (its sealed behind the growth surface), so you don't have to get an airstone. The bubbler is simply vinyl air hose that has been cut lengthwise, and with cross-cuts, to form little flexible segments that are both adjustable and open-able to allow for easy cleaning. This HOG1x will run on both 120V and 240V, and comes with a 10 ft (300 cm) power cord with a U.S. plug. If you require a different plug you can get an adapter at any local hardware or travel store, or online, or you can cut off the U.S. plug and install your own plug from a hardware store. Comes with 3 ft (90 cm) of vinyl airline, but requires an air pump that can pump at least 1.0 liters per minute (.04 cfm), which medium-cost air pumps can usually handle. Pumps that say they can handle 2 or more airstones/outlets, or pumps with 2 tubing attachments instead of one, will usually be more than enough. You can have as much air as you like, however; 5 lpm pumps are no problem. One powerful pump which works exceptionally well for a low cost is the Fusion 700 from JW Pet (which we sell too). It is quiet and has two outputs which are adjustable by turning the control knob. Another even more powerful and completely silent pump, although more expensive and without a control, is the Whisper 300 from Tetra. With either pump you will need to combine the two outputs into one to feed the scrubber, using something such as the "Tee" air line tubing fitting from Tom Aquatics. 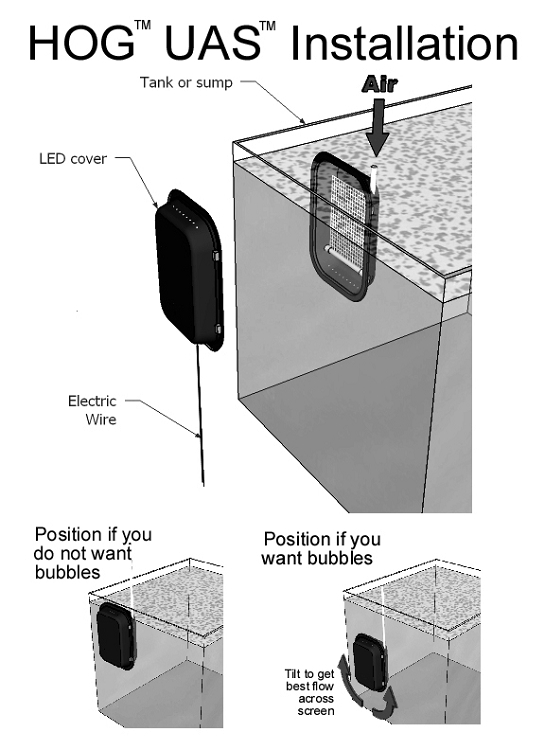 Make sure to put the air pump above the aquarium so that it will not drain any water if it shuts off. 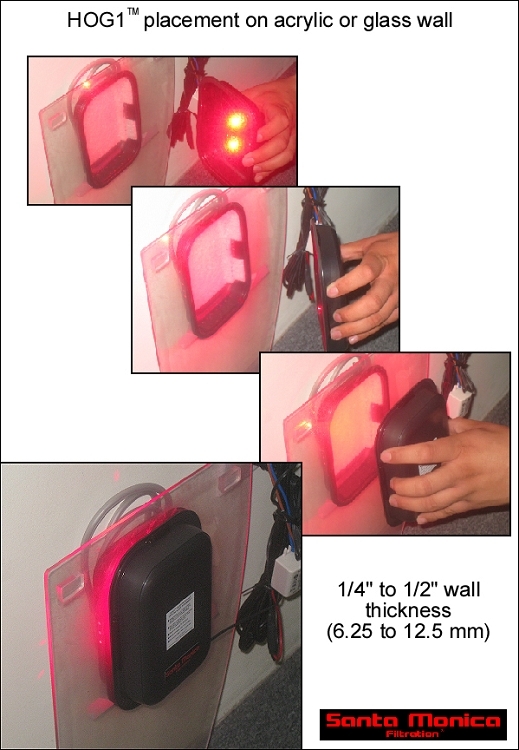 Comes with 4 red (660 nm) 3-watt LEDs, which are attached to 2 heat sinks inside the cover; the cover gets warm on the outside. 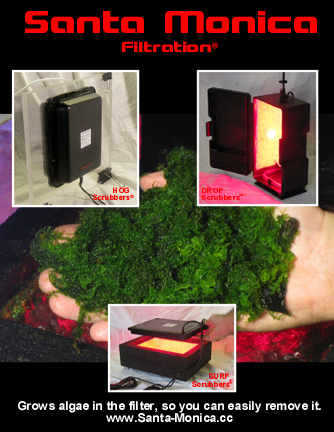 The LEDs will give the aquarium or sump a slight red color at night when the aquarium lights are off. You will need to get a timer so you can run the LEDs for up to 22 hours per day (not 24). The LEDs never needs replacing. 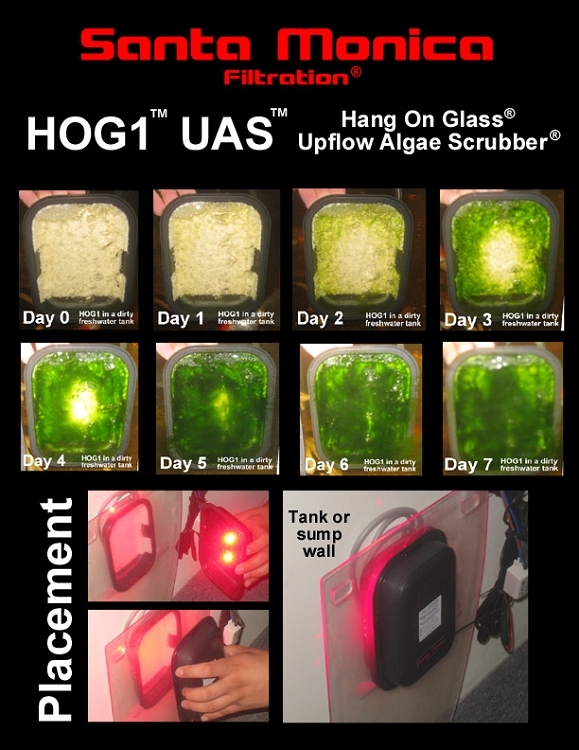 The HOG1x growth surface will need to be cleaned every 7 to 21 days, by removing the inside cover, disconnecting the airline, and taking the inside cover to the sink so you can brush the algae off of the growth surface and bubbler with a toothbrush. No hard scraping is needed; just brush it with a toothbrush. 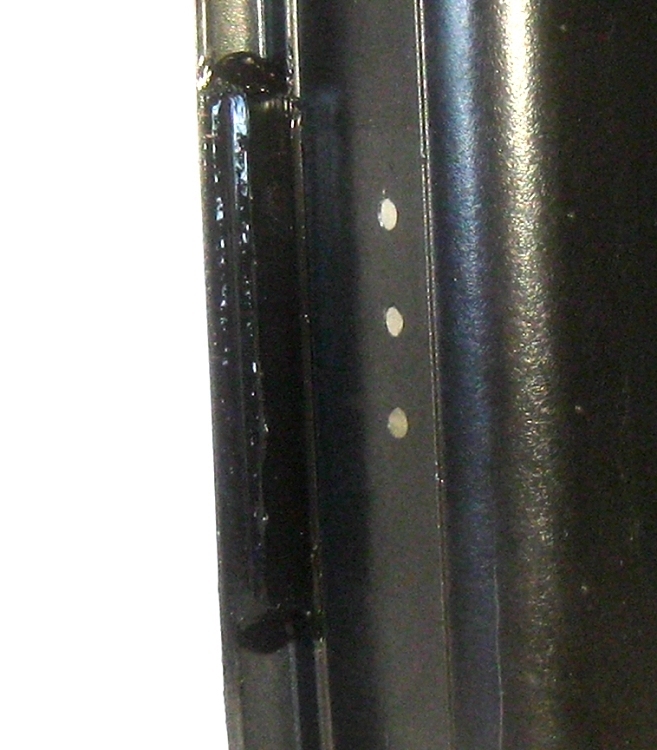 The Green-Grabber growth surface is permanently glued to the inside cover using epoxy, however a few of the Green-Grabber particles may dislodge during the first few cleanings, which is normal. 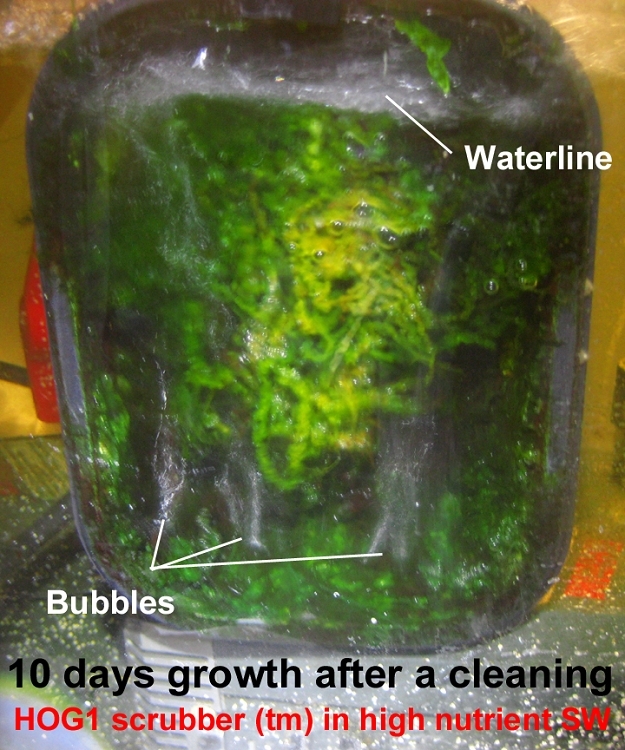 Cleaning the growth surface, bubbler, and the inside cover takes about a minute with a toothbrush. The HOG1x comes with a 6 month warranty: Warranty is for replacement or repair only; not a refund. Costs for shipping back to us are not covered; you will need to ship the entire unit back to us before we can ship a replacement. Warranty is limited to repair or replacement, and does not cover fish loss, personal injury, property loss, or direct, incidental or consequential damage arising from the use of it. The warranty and remedies set forth above are exclusive and in lieu of all others, whether oral or written, express or implied. We specifically disclaim any and all implied warranties, including but not limited to lost profits, downtime, goodwill, damage to or replacement of other equipment and property, and any costs of recovering animals, plants, tanks or other aquarium related items and/or equipment. We are not responsible for special, incidental, or consequential damages resulting from any breach of warranty, or replacement of equipment or property, or any costs of recovering or reproducing any equipment, animals or plants used or grown with this product. Can be shipped to any country; you can find shipping costs by using the shopping cart; be sure to click "display rates". If you don't have a zip code, enter "zip code" instead. Note that shipping outside of the USA will probably require you to also pay an import charge when it arrives. We cannot mark it as "gift". The lowest cost (but slowest) foreign shipping is generally USPS First Class Package International, but USPS Priority Mail International is better because it is faster and has insurance. The size of the shipping box is 10 x 7 x 5 inches, 25 x 17.5 x 10 cm). 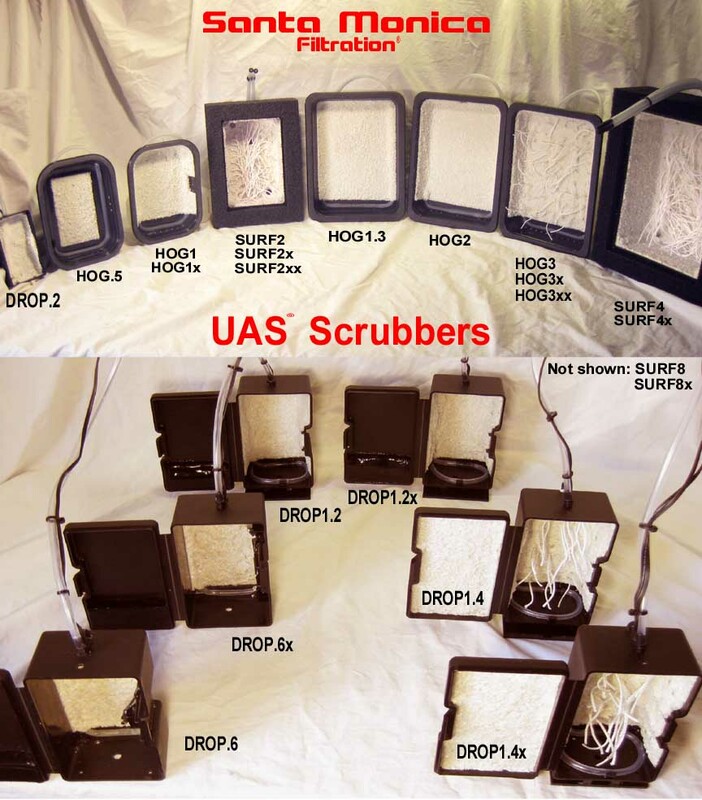 HOG1x size: Each cover is 5" wide x 6 5/8" high x 1" thick (12.7cm wide x 16.8cm high x 2.5cm thick). It requires at least 5" (12.5cm) of water to operate in. "I got the HOG1x on tank running for 3 weeks, looks very promising, brown dust on glass has been reducing since adding the ATS" -- RNgracias on the MASA site. "Super Service on all levels; [HOG1x] as described. Everything nice!" -- silver_surfer_lu on ebay. "I didn't really expect much from [the HOG1x] and put it in my sump. 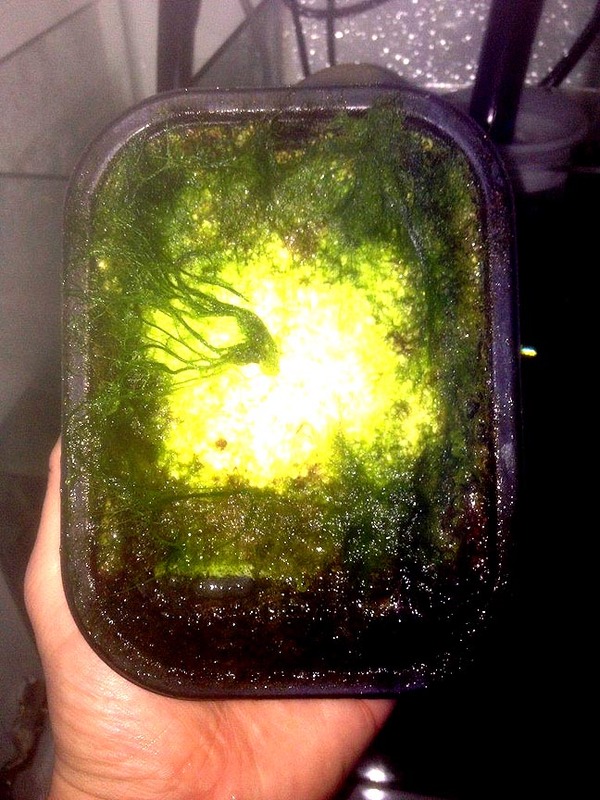 After about 3 weeks the algae was in abundance and now I have to clean it every 2 weeks" -- Jukeboxjury on the RF site. 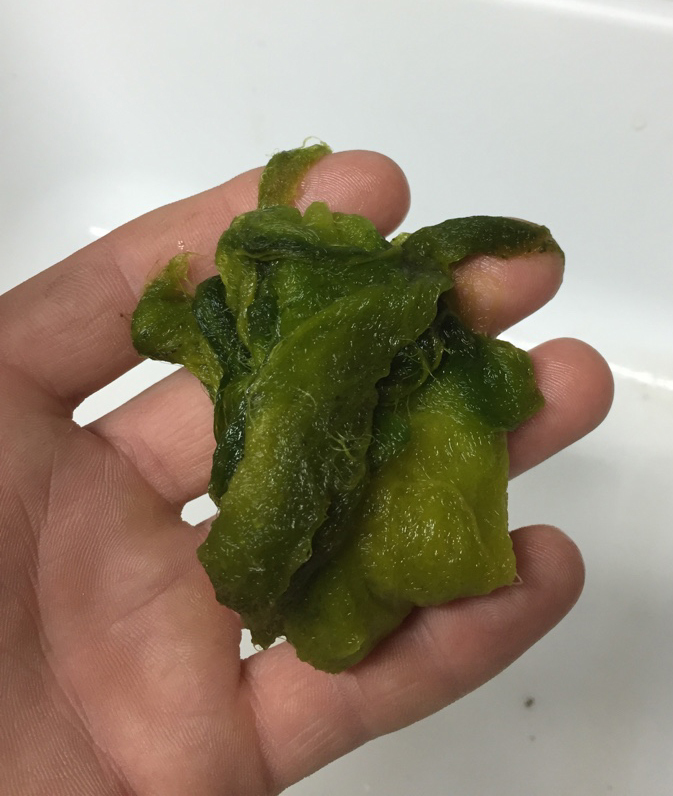 "It cured my cyano problem in about 3 weeks!" -- "FlyPenFly" on the scrubber site. "Fantastic product [HOG1x] and customer service!! I hope to do business again soon!" -- thebusinessspecialist on ebay. 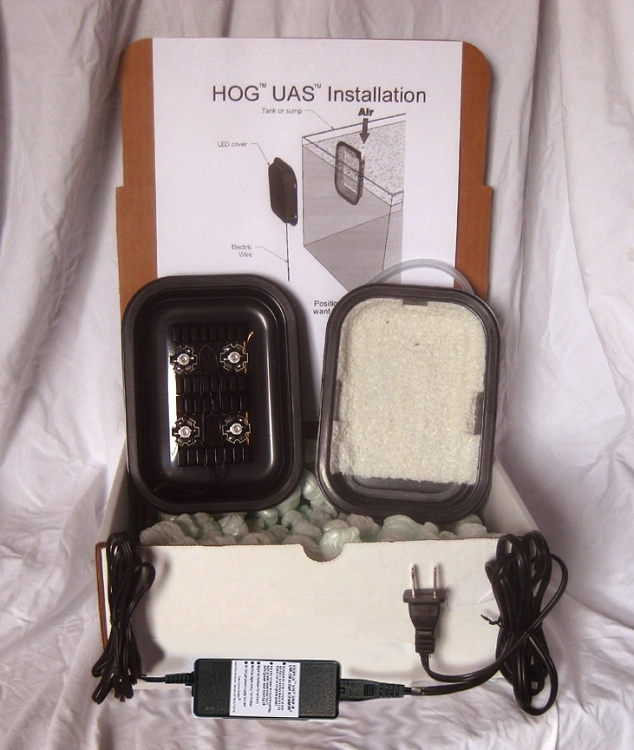 Great Service [HOG1x] posted within hrs of order" -- 76fogg on ebay. "Prompt international delivery [HOG1x]" -- defencegifts on ebay. "good to deal with [HOG1x]" -- dog61153 on ebay. "great service [HOG1x] many thanks" -- casagk26 on ebay. "Awesome product! [HOG1x] Worth every darn penny!" -- bigwrench311 on ebay. "Perfect [HOG1x], thanks" -- stopasco on ebay. "Five stars [HOG1x]" -- lexmaniac2 on ebay. "Arrived quick! [HOG1x] Thanks!" -- martcourt1116 on ebay.